Falling development or a shift in focus? Looking at the entire market, UK-wide take-up was relatively respectable in 2017, standing at 96.5m sq ft and falling only 1% short of the five year annual average. However, 2017 was a real game of two halves; had the stellar take-up in the first half of the year been repeated in the second half, 2017 would have been a record year by a distance. The main culprit for the quieter second half of the year was logistics. Take-up in units above 100,000 sq ft was 38% lower in H2 compared with H1, putting the total for 2017 at 19% below 2016’s record total. However, this was largely down to a reduction of particularly large build to suit deals, with the frequency of logistics deals actually holding up well. In a reversal of fortunes from 2016, the mid box segment was arguably 2017’s star performer. Take-up rebounded by 19% on 2016’s level and was the second strongest annual total on record. Meanwhile, activity in the small and medium-sized sectors was relatively consistent, improving 5% on 2016 and exactly in line with the five year average. Against broadly consistent demand at the smaller end of the market, a patchier year for logistics largely dictated 2017’s ‘winners and losers’ at the regional level. 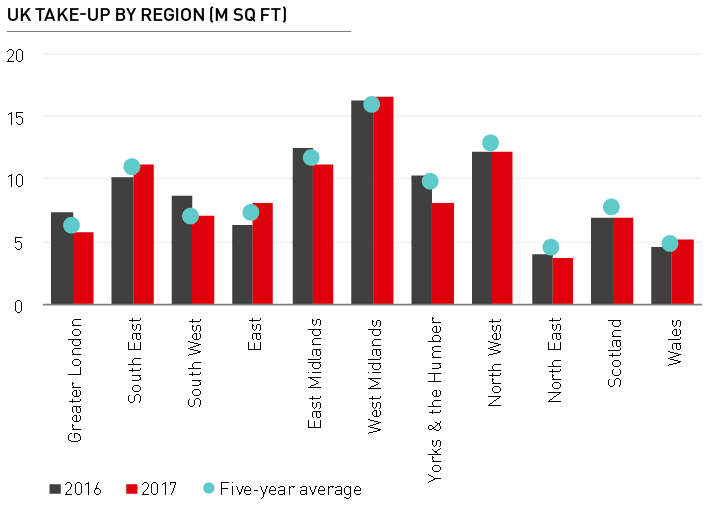 The East region was the UK’s best performer, with its strongest year of take-up since 2010, while the West Midlands, South East and South West all saw take-up ahead of trend. With take-up 16% below average, Yorkshire & the Humber was the UK’s worst performing region against trend in 2017, albeit resulting from subdued logistics and mid box take up. The East Midlands also had the most disappointing year, with take-up 4% below average despite a significant improvement in the availability of quality product. Despite continuing speculative development, overall UK-wide supply fell for a seventh successive year to a new all-time low of 156m sq ft. However, indicative of improving balance in the market, the year-on-year fall of 3% was modest compared with recent years. The UK availability rate fell edged down marginally to 4.4%, less than half its peak level in 2011. However, there were contrasting movements in supply between size bands. 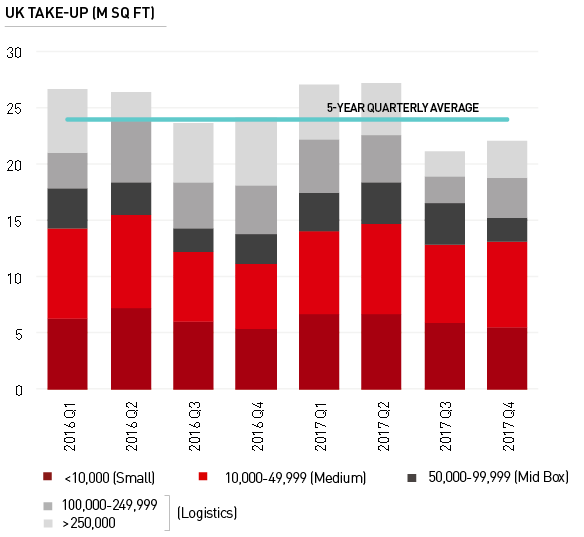 For the first time since 2010, supply of logistics space did not decline. 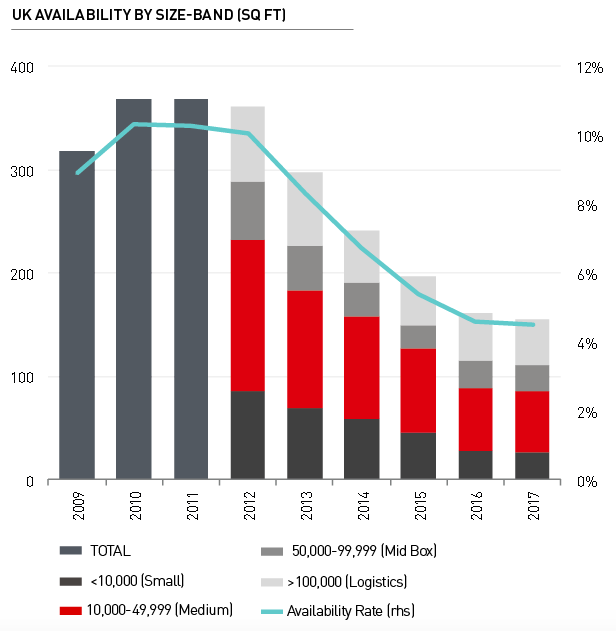 Meanwhile, reflecting healthy absorption of grade A space, UK mid box supply fell by 10% during 2017 following a sharp increase the previous year. 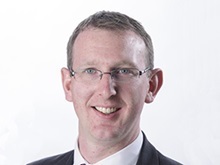 A welcome increase of small unit development has helped to arrest steep falls in supply, with availability in the small & medium size-band (sub 50,000 sq ft) falling only 3% year-on-year. This segment is nonetheless the UK’s most acutely supplied for grade A space, equivalent to only three months of average take-up. For a fifth successive year, average growth in UK secondary rents was ahead of prime, rising by 5.1% in 2017. With our rental figures demonstrative of 20,000 sq ft units, the result indicates that strong competition remains for dwindling levels of secondary space. Growth varied considerably between locations. Following strong growth in 2016, the North West saw muted average prime rental growth of only 1.0% in 2017. Meanwhile the London markets saw average growth accelerate to 8.2%, a figure which included a 22% upward movement in Enfield, the strongest growth of any UK location during 2017. 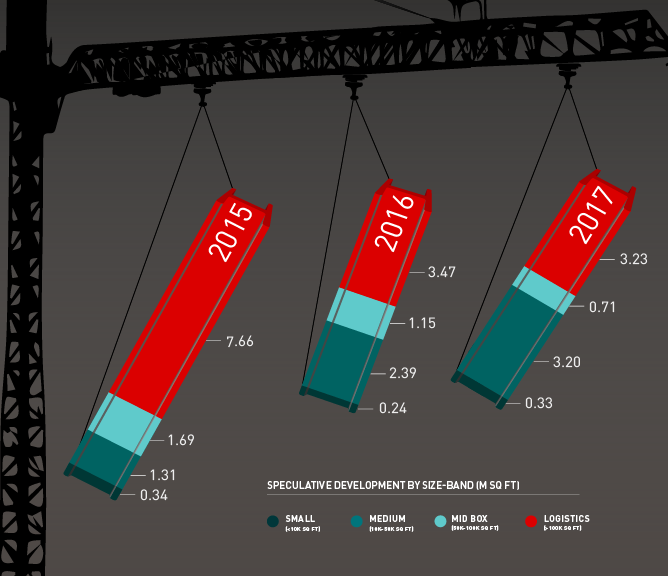 The recent industry press has made much of the fact that speculative development has decreased sharply in 2017 from its peak level two years ago. However, with analysis restricted towards larger unit sizes, typically in excess of 100,000 sq ft, it gives a misleading impression of activity across the wider market. Taking all size ranges into account reveals that the total volume of speculative space under construction around the UK increased by 3% year-on-year and is only 31% below its peak level in Q1 2016. Moreover, the number of units coming forward speculatively actually stands 15% higher now than it did two years ago. The focus of speculative development has clearly shifted towards the smaller end of the market. While the amount of available logistics space under construction has more than halved from 2016, development activity in the medium sized sector (10,000 sq ft to 49,999 sq ft) has trebled over the period, and, at 3.2m sq ft, now stands almost identical with logistics. 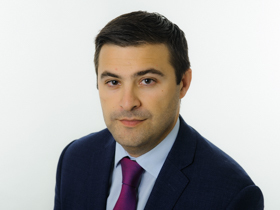 While Brexit-related uncertainty abounds, the structural imbalance of supply and demand continues to provide a compelling case for speculative development. Indeed, a pick-up of larger unit (mid box and logistics) development is in store in 2018, with circa 7.3m sq ft deemed relatively certain to come forward speculatively across the UK during 2018, compared with 5.9m sq ft of development starts in 2017. 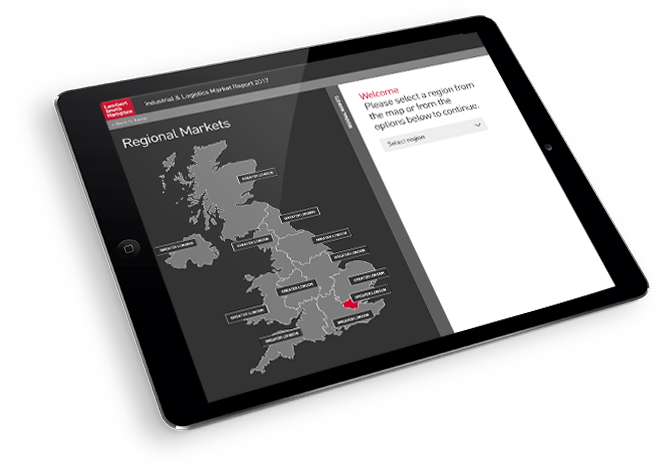 Explore take-up, availability, rents, prime land values and key deals across the UK. The year has started exactly where 2017 left off. Stock is changing hands across all sectors of the market, appetite appears insatiable and yields remain under pressure. With question marks appearing over rental growth aspirations, finding value in the market without undue risk is the main challenge in 2018. While 2017 was a busy year for the wider UK investment market, industrial & logistics stole the headlines. 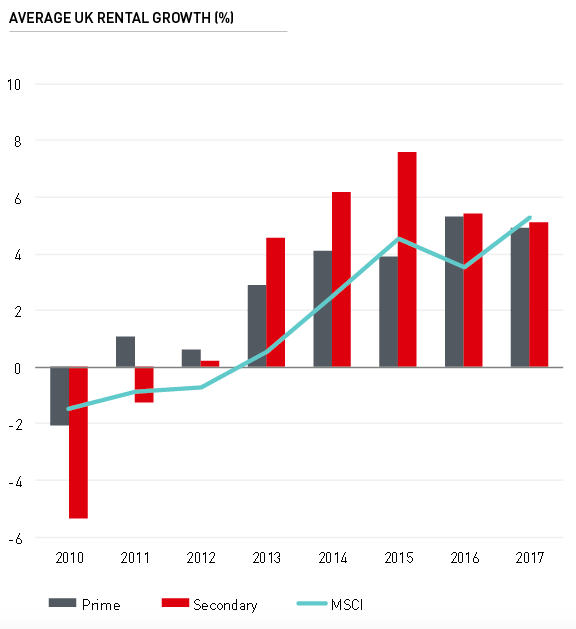 Reflecting insatiable appetite across all subsectors and asset qualities, a record £7.5bn of industrial assets changed hands during 2017, up 44% on 2016’s total and smashing 2014’s previous high of £6.7bn. Furthermore, no individual sub-sector stood out from the rest in 2017. 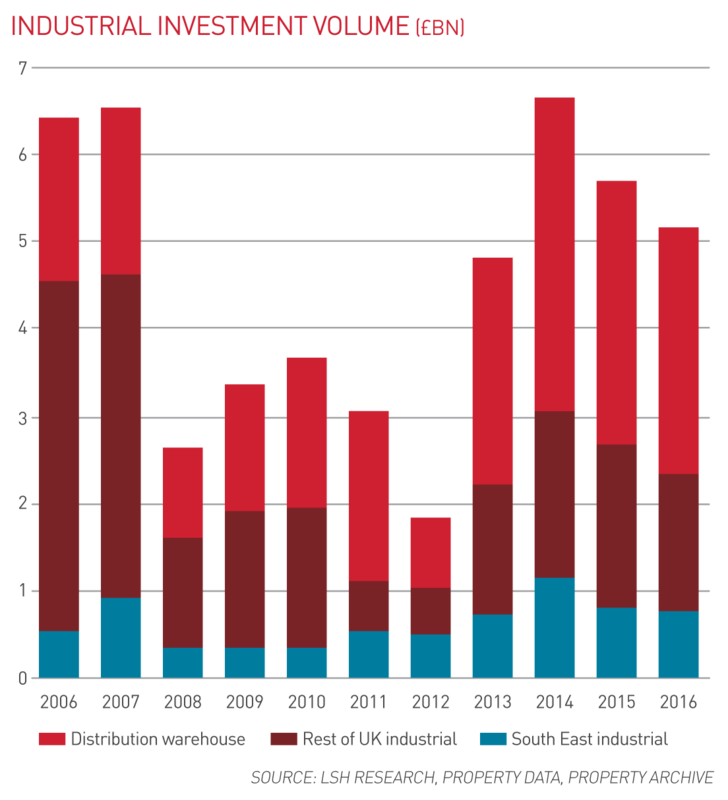 Record annual volume was seen for both distribution warehouses (£3.8bn) and South East industrial estates (£1.4bn), while the rest of UK estates volume of £2.4bn was far ahead of anything seen over the past ten years, reflecting the positive fundamentals in the occupier markets and an avid search for product. Underpinned by profound structural changes in retailing, industrial’s position at the top of the investor wishlist is clearly reflected in its share of activity in the wider market. Industrial accounted for 20% of total volume across the three main sectors (i.e. retail and offices) in 2017, having typically made up around 12% to 15% of volume over the past 15 years. 2017 was also remarkable for the sheer depth of demand for industrial product and market liquidity. While record annual volume was boosted by several major portfolio transactions, the largest being Blackstone’s £559m purchase of the Brockton/Dunedin portfolio in Q3, the year saw 540 separate deals, up 51% on 2016 and 39% above the previous record year for volume in 2014. While UK industrial & logistics is widely coveted by a spectrum of buyers, 2017’s record year ultimately reflected the emphatic return of institutional buyers into the market alongside the deployment of unprecedented levels of overseas capital into the sector. Having been significantly affected by the Brexit-vote in 2016, institutional activity returned to form in 2017. 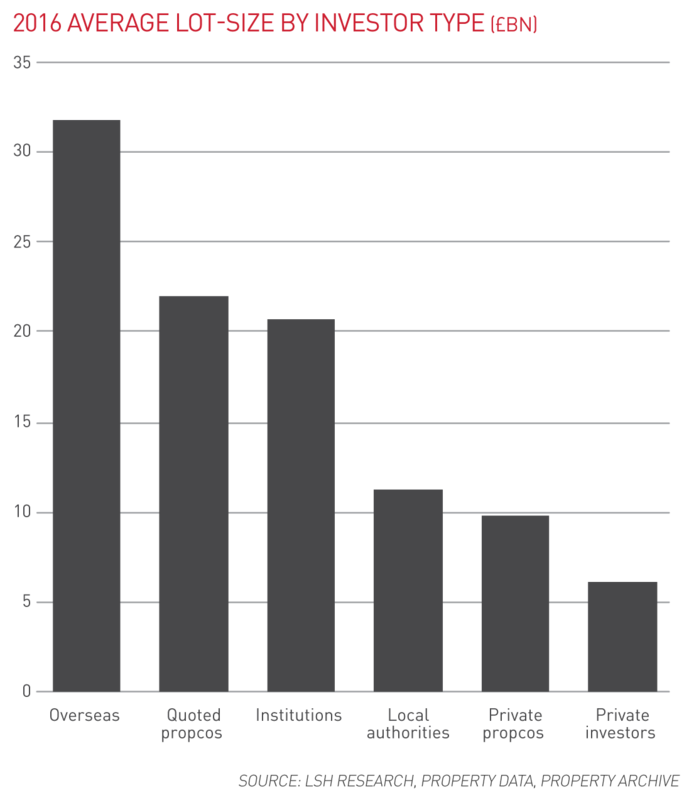 At £2.0bn, institutions were the largest buyers by volume in 2017, with Aviva (£193m) and L&G (£235m) both taking a significant share of activity. That said, with disposals amounting to £1.65bn, institutions were also 2017’s most active sellers after private property companies, reflecting the desire among many to crystallise significant gains in the market. 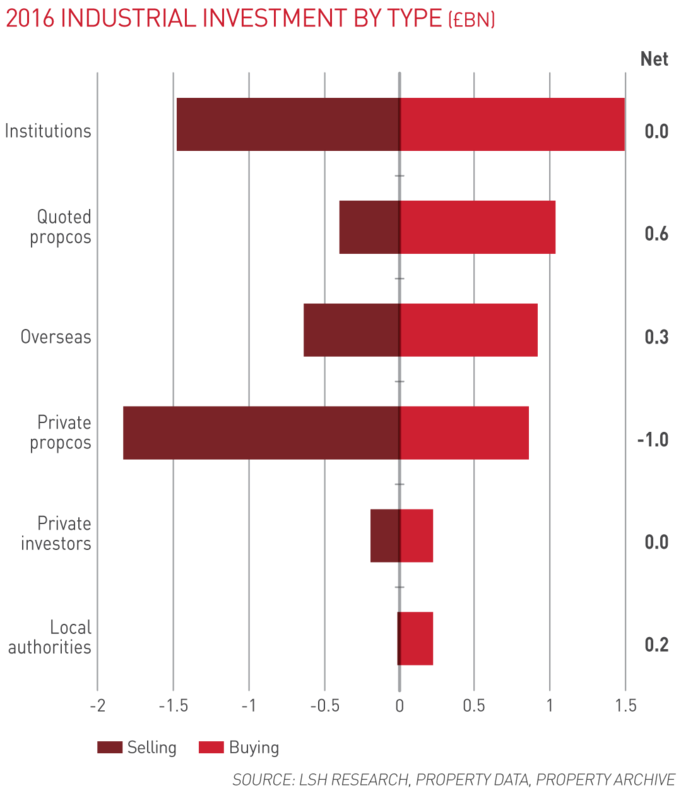 UK industrial has also emerged as a prime target for overseas capital, spanning North America, the Middle East and Far East. With record volume of £1.8bn, overseas buyers accounted for a substantial 25% of total volume in 2017. Moreover, having traditionally been universally focused on distribution warehouses, overseas buyers invested circa £900m into multi-lets in 2017, albeit dominated by two portfolio deals. However, for the second successive year, quoted property companies were the largest net buyer of industrial & logistics assets, amounting to £760m in 2017. While the referendum outcome had a severe impact on the major UK REITS, the share prices of distribution REITS such as SEGRO and Tritax have performed extremely well, fuelling aggressive activity in the market. Tritax BIG BOX was again the largest quoted buyer in 2017, accounting for a third of volume, followed by SEGRO with 27%. Local authorities remained very much active during 2017, acquiring a total of £282m worth of industrial assets in 2017, up 26% from the previous year. While this represents a relatively small share of the total volume, their focus on quality assets of typically sub £20m lot-sizes added significantly to competition in certain pockets of the market. The extent to which prices increased throughout 2017 was nothing short of spectacular. In sharp contrast with other commercial property sectors, all segments of the industrial & logistics market saw at least a degree of yield compression, regardless of sector, asset quality and location. As expected, industrial was the UK’s lead performing sector in 2017, although much more surprising was the degree of outperformance. 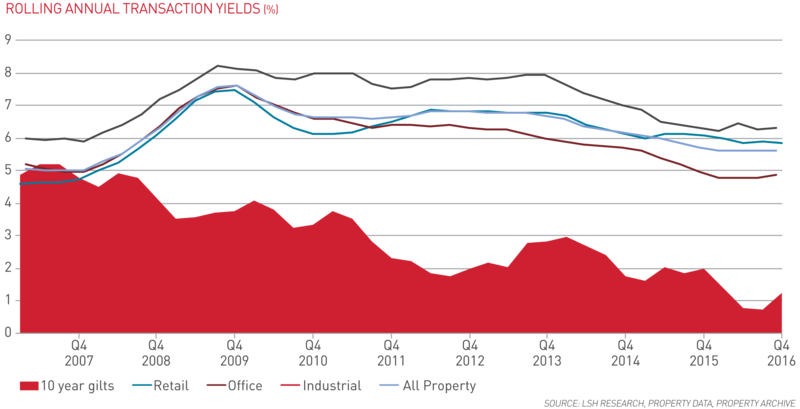 According to MSCI data, against an All Property return of 10.2%, UK Industrials returned 19.6% in 2017. 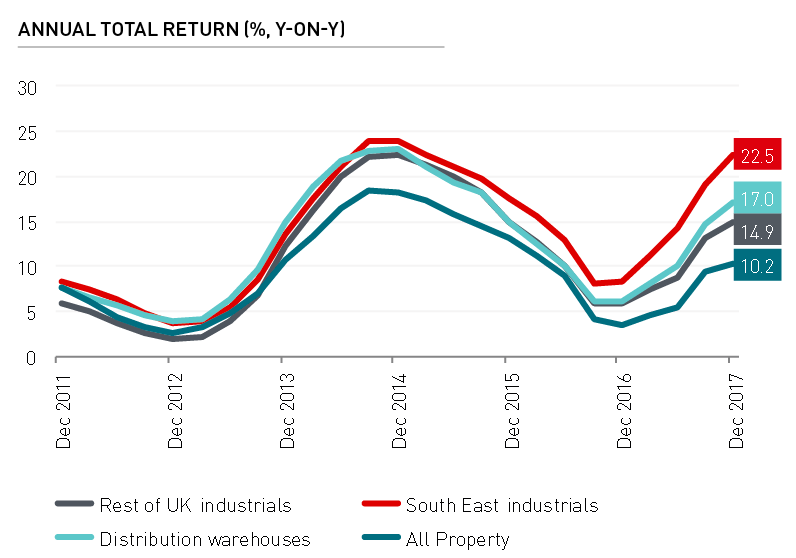 Furthermore, with annual returns of 22.5%, South East Industrials was the strongest outperformance by any segment of the UK property market since retail warehousing in 1991. The UK average industrial transaction yield moved to a new all-time low of 5.49% in Q4 2017, standing a substantial 60bps below that of retail. With retail historically commanding an average 80bps premium over industrial, this is a clear demonstration of how structural change in shopping patterns is shaping market activity and investors’ perception of risk. The amount of yield compression is all the more remarkable considering the high liquidity in the market, with seemingly as many sellers keen to capitalise on significant price increases as there are buyers prepared to bid ever higher. Q4 2017 brought firm transaction-based evidence of yield shift within the key sub-sectors. Prime yields for South East multi-let estates hardened by a further 25bps in the quarter to stand at 4.00%, while prime regional multi-lets hardened to the same degree to stand at 5.00%, 75bps keener than 12 months previously. Benefiting from both ongoing shortages of supply and the steady structural shift to e-commerce, UK industrial & logistics is well placed to outperform the wider market once again in 2018. However, with arguably limited scope for further yield compression, income growth will be key to maximising returns in 2018 and beyond. 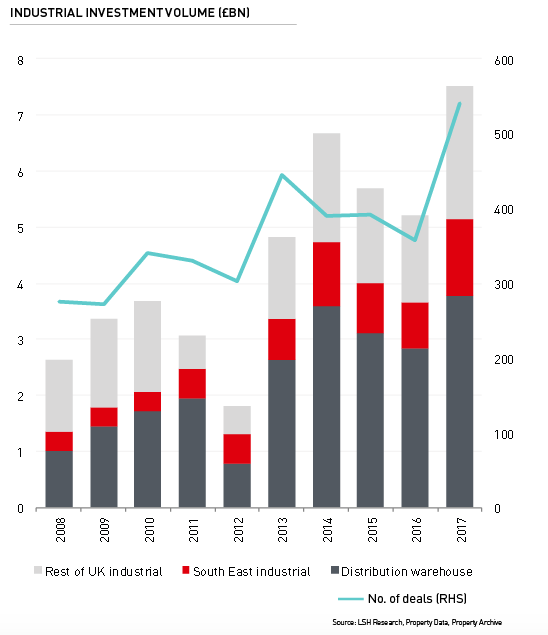 While the pace of rental growth is set to ease and become more locationally sporadic, industrial is forecast to remain the lead performing sector at the UK level over the next five years, with further growth in rental levels projected throughout of the UK. This growth, rather than yield shift, will be key to medium term performance, with UK industrial returns forecast to outperform the wider market once again in both 2018 and over the five year horizon.